customer was wearing the typical sling with a pillow to support his arm and shoulder). 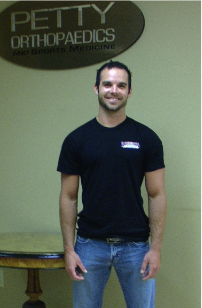 Casey asked the customer about his shoulder surgery and the customer said that he had been to several doctors before Dr. Petty was finally able to help him. The customer gave Casey Dr. Petty's card and, soon afterwards, Casey went to see him. Dr. Petty confirmed that the shoulder instability was due to a significant amount of bone loss from the glenoid, the bone that supports the humeral head. The surgical repair was complicated. Dr. Petty cut a piece of bone out of Casey's pelvis, selecting a location where the curvature of the pelvis approximated the curvature of the ball joint. He then shaped the harvested bone as necessary to provide a perfect fit with the damaged glenoid bone and match the shape of the humeral head. Dr. Petty then attached the bone piece to the glenoid using three anchors. Three years after surgery, Casey has full use of his shoulder and has resumed wakeboarding, which he describes as "the love of my life," as well as other athletic activities including white water rafting and throwing a baseball with his 6 year old nephew.